Tiger Woods will once again host the AT&T National tournament at the Congressional Country Club in Potomac, MD June 25th – July 5th 2009. In preparing for the tournament Classic Glass has been commissioned to produce 6 new leaded glass panels. The pattern is a traditional Tudor (diamond) style with clear textured glass known as “water glass”. 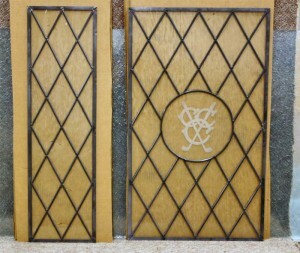 Two of the panels feature a center medallion with the Congressional Country Club logo etched in the center. The glass will be installed into wooden partitions at the newly refurbished “19th Hole” Congressional Country Club will host the AT&T National through 2009 and then again in 2012 through 2017. More information about the tournament can be found at the link below. This entry was posted on Thursday, June 11th, 2009 at 9:58 am	and is filed under Decorative Glass. You can follow any responses to this entry through the RSS 2.0 feed.Both comments and pings are currently closed.